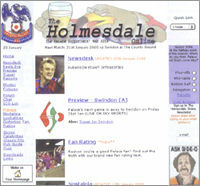 The Holmesdale Online (HOL) was created in the summer of 1999 when two school mates teamed up to produce a website for their favourite football team. 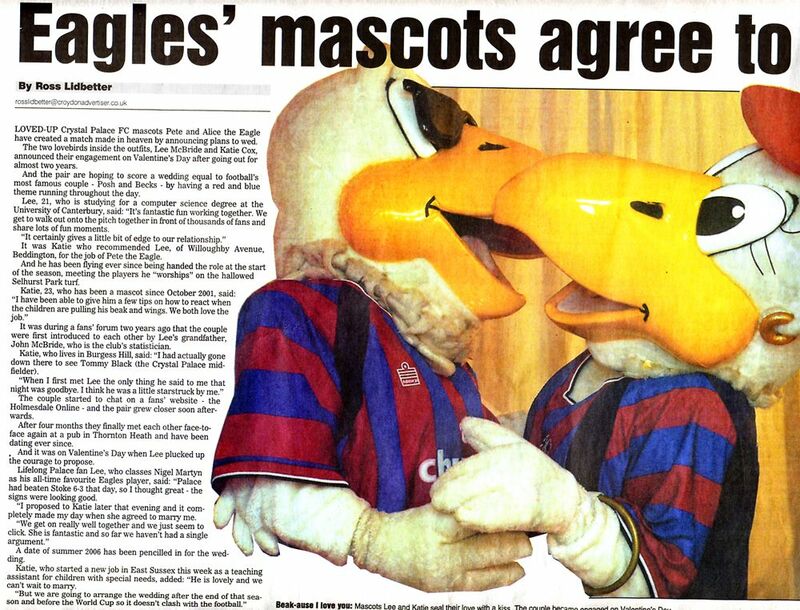 Web developer Peter Guntrip and journalist Gordon Law worked hard to make a Palace website which was a bit different to the rest and during the summer months put it together to be launched in time for the 1999/00 season. The HOL went down well amongst the Palace web community and slowly the hits increased and increased as word got around as fresh content was added. 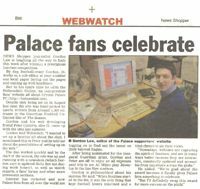 It was the first Palace site to have a chat room, audio, downloads, photo gallery, fun and games and prediction league. A message board built by Peter was eventually added and it quickly became by far the most popular section. Members rushed to sign up to join the discussions on the boards. 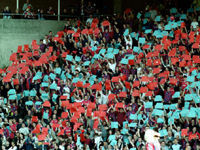 Blackburn at home, saw a mini card display organised by the HOL message board community in the Holmesdale Road Stand. 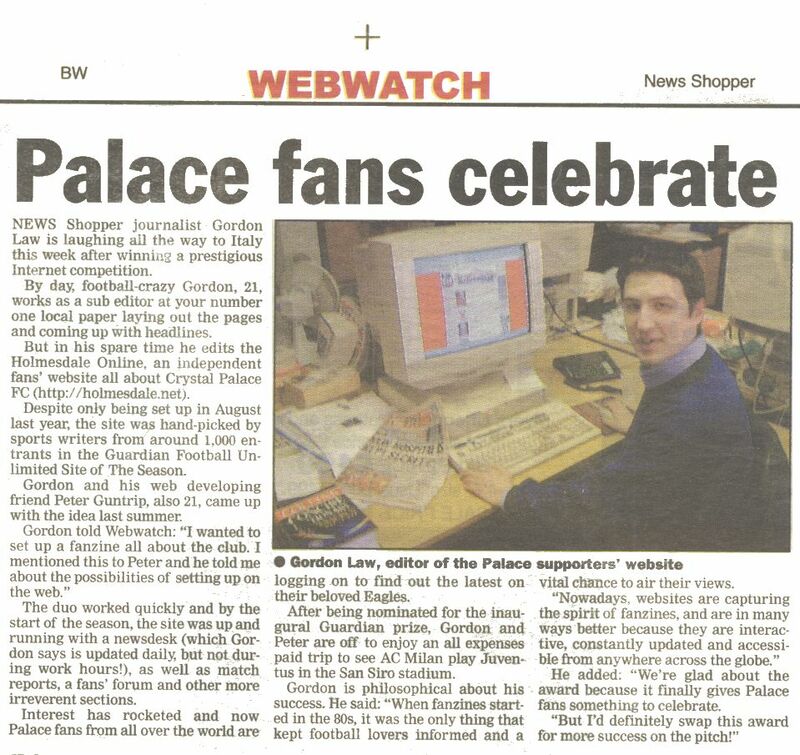 Keeping the website contantly updated is a time-consuming task and Dutch Palace fan Joey helped out in the early days by adding news stories. 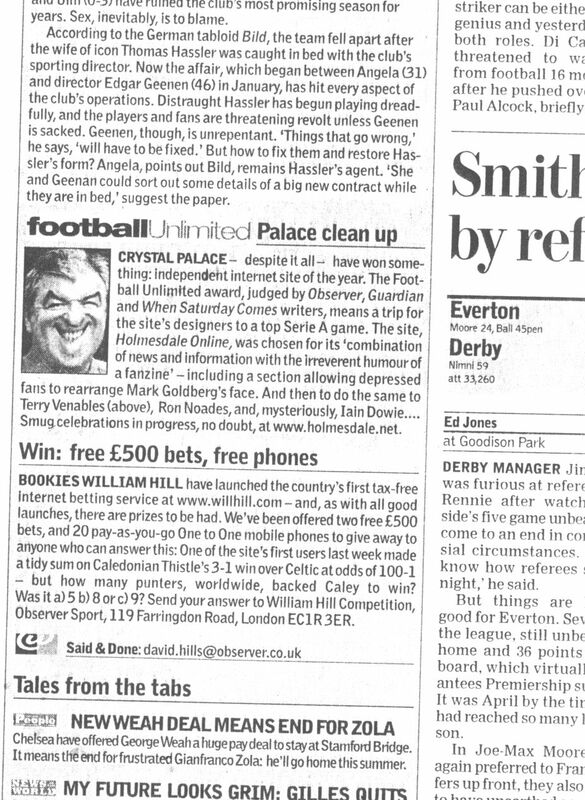 Palace Radio and Capital Gold commentator Gary Taphouse started writing a popular column From the Press Box. Then in February 2000, the HOL team were awarded the Guardian newspaper's unofficial football site of the season award, beating off competition from thousands of football websites from around the UK. At the end of the season, HOL site members chipped in to buy a special plaque for Steve Coppell for the fantastic work he did in keeping the Eagles up and it was presented on the pitch after Palace's last game of the season by a HOL member. Soon after, the team was approached by the newly-formed Rivals.net corporation and asked to join their fan site network. It was a tough decision because joining Rivals meant the HOL would have to use Rivals' rigid, boring, template design and lose its unique identity. But Rivals would host the website on its server and generate cash through promotions and advertising. It was a tempting offer and it just about swayed the decision to join. Due to the popularity of the Rivals.net network and the community of fans from clubs around the country, the hits increased. But Gordon and Peter became frustrated with the lack of control, Rivals' poor technology and excessive advertising as the dot.com bubble began to burst. 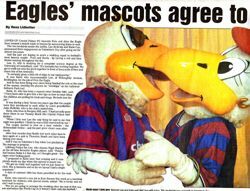 The HOL decided to become independent again and over the coming months started preparing a new super site which was launched shortly into the 2001/02 season to the delight of the majority of users. 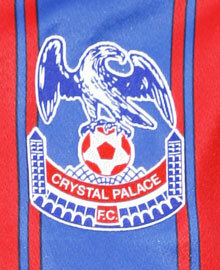 More unique content has since been added such as Palace ringtones, email news alerts, feature articles, player ratings and an extensive archive. The HOL sponsored Simon Rodger for his last two seasons at the club and Tony Popovic for 2002/03. It has been featured in Sport First, 442 and Match of the Day magazines and regularly in The Observer. Also awarded the coveted Golden Crust award from All the Pies webzine - probably the most prestigious prize on the web awarding football web sites of merit and distinction All the Pies Golden Crust awards. Special thanks must go to members of the HOL team who helped out in the past and also to our current team: Joey (match score updates); Jamesey (columnist); Cucking Funt, Old Chap, Moose, Pikey Eagle, rach_d_cpfc and jcreedy (message board moderators) and Elliott Hutchins (preview stats). Comments and suggestions are always welcome so don't hesitate to email in. 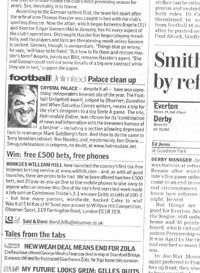 When Colonel Gaddafi was rumoured to have made an enquiry about buying Palace, Gordon spoke to Radio One.